After studying in Philadelphia and Paris, Cecilia Beaux established herself as a formidable portraitist. She specialized in intimate scenes of mothers and children using a painterly yet realist style. At the same time, this painting is more informal than many by the artist. Here, the subject strikes a seemingly spontaneous and playful pose, as she caresses and tickles the child in her arms, a gentle smile emerging on her lips. Although her dress is equally informal, Beaux took care in rendering the beautiful lace of her collar and sleeves and the vibrant red of her dress. The painting reinforces the virtues of motherhood integral to nineteenth century notions of gender. Cecilia Beaux and the Art of Portraiture, National Portrait Gallery, Washington, DC, 1995, p. 98, pl. 27. 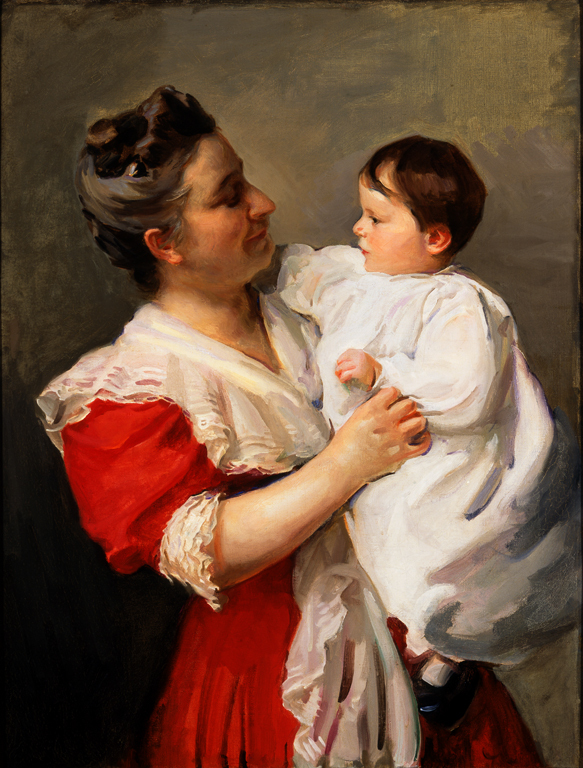 Cecilia Beaux: American Figure Painter, High Museum of Art, Atlanta, Tacoma Art Museum, Tacoma, WA; Pennsylvania Academy of the Fine Arts, PA, 2007-2008.